The benefits of music are endless but they are especially wonderful to growing and developing children. Music has the ability to fill us with energy and really get us moving which is great for those who are undersensitive and need extra stimulation or for those who have been sitting in school all day. On the other side, music can calm us down and relax us which is great for those with ADHD, Asperger's and those in pain or stress. Music helps us express our emotions even when words fail us. There is nothing like banging on a drum when angry, dancing with a scarf when happy or swaying to a lullaby when tired or scared. 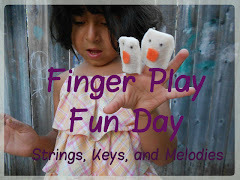 So, for children who have a hard time expressing themselves, music becomes their language. Studies show music creates new neurological paths in the brain, stimulating our brains and therefore making us smarter. Playing an instrument helps develop eye-hand coordination as well as confidence and great self-esteem. It also develops discipline as the student practices and realizes a goal. Music is also a vehicle to learning other subjects. Practically every child learns the alphabet by singing the ABC Song. 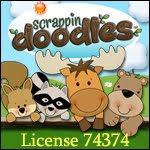 There are numerous songs to learn colors, numbers, adding, subtracting, geography and other important facts. As parents and teachers, we need to expose our children to music in all kinds of situations. And continue to encourage them to explore and make music on their own. So important! My oldest learns so well through music. I noticed that he could sing his ABCs before he was even 2 years old so I started using music for just about everything, learning to spell his name, daily routines, etc. Thanks for linking up at we teach! 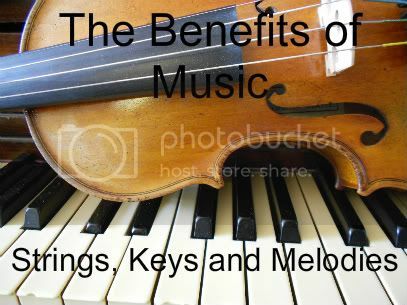 The benefits of music are huge! I think it's wonderful you have started a blog to help people of all musical abilities share music with kids. Thank you. Songs are great for teaching all kinds of subjects! I have done the same thing with my daughters. Thanks for reading! I love this post! Music is a fantastic teaching tool! Nice post. I learn something totally new and challenging on websites I stumbleupon everyday. It’s always exciting to read content from other authors and use something from their sites.